HAG – the History and Archaeology Group – arose from the purchase of Torpel Manor Field in 2009 by the Langdyke Countryside Trust. 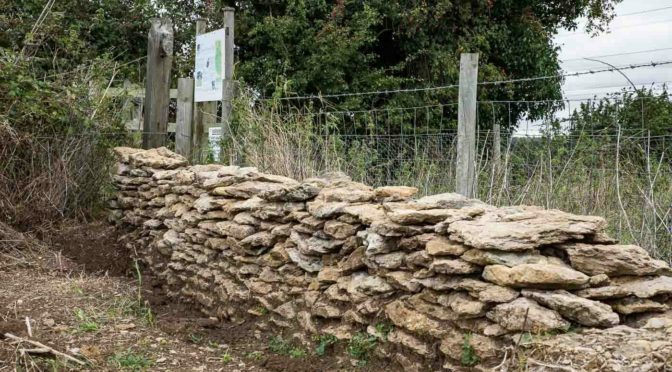 Langdyke was interested in managing and improving what was already a listed county wildlife site for limestone grassland species. However it soon became apparent that the listing of the field by English Heritage would offer a unique opportunity within the area to explore and interpret a piece of local heritage. The field had been known for its ‘humps’ and ‘bumps’ which were obvious to the trained eye as being a site of potential medieval origin. Martin Bradshaw, the well-known geologist, walked around the site one Christmas with friends from York University’s Department of Archaeology who were keen to offer expert help and guidance. Steve Ashby, the senior lecturer in the department, has been the lead in this work. Martin and prominent local historian Frieda Gosling put together a small team of volunteers to begin the research. This was the nucleus of HAG. Early tasks undertaken by the volunteers included gathering references from museums and archives such as Northampton and Lincoln Record Offices. Peter Wordsworth was prominent in this and built on Frieda’s groundwork. Mapping expertise came from Peter Leverington (now the Trust’s membership secretary). A desktop research project report was compiled by Robin Van Splunder, a York University student doing her MA. As a plan of action developed, the Trust decided to apply for an HLF grant to cover developing the site, researching its history and disseminating discoveries via publications and the setting up of an interpretation centre on the site. A publicity article by Frieda in the Stamford Mercury brough Mike Clatworthy on board. A former head of several field study centres and a keen amateur archaeologist, Mike became the warden of the Torpel Manor Field Centre on its opening. He later succeeded Frieda as chair of HAG. HAG set up a programme of community activities, guided by the generous unpaid help of the York University Department of Archaeology staff. The aim was to use modern non-invasive methods to gather information about the site, which would form the basis for a book and also provide the interpretive display panels now on the walls of the cabin. This has now been achieved. HAG has gone on to extend its research into the landscape around Torpel through such activities as field walking, mapping and a programme of test-pitting. There is also an ongoing project to restore sections of the medieval stone wall around Torpel field. Further research is planned and everyone is welcome to join the group, regardless of age or experience. The Langdyke History and Archaeology Group has produced a book documenting the work that has gone into discovering the rich heritage of Torpel. The book is the culmination of 4 years` research, ranging from feld walking in the mud in the potato feld to the north, transcribing Trollope archives held at Lincoln museum dating back to the 14th century, and co-operation between the Langdyke group (HAG) and the team of York University archaeologists. The determination and dedication of our volunteers has been inspirational. From start to finish it has been a community project. It would have been so easy to hand over the archaeology research to a commercial organisation but less satisfying and certainly much less fun. The Torpel book is called a biography because it tells the story not only of one feld but also of the changes in the countryside and society from the earliest beginnings until the time of John Clare. When Langdyke Trust bought the Field in 2009 it was in a very poor condition, having been overgrazed by horses for many years, hence the abundance of nettles and thistles. The only buildings were a cluster of rat infested, leaking stables and a very large pylon which had beenstuck right in the middle of the Field. We were all aware of the humps and bumps particularly in the south western quarter but very little was known about the Field`s history. However, its signifcance had already been recognised because it had been designated as a Scheduled Monument of national importance by English Heritage. This protected it from development but means that we are not allowed to dig pits or trenches. The frst signifcant event was the Heritage Lottery funding which paid for the building and equipping of the cabin and there was an allocation of money for archaeology and historyresearch. There were so many unanswered questions. Who dug the ditches and why and when? Who was Roger de Torpel and when and why did he choose this site for his fortifed manor house? Was there already a village called Torpel (small settlement)? How was his manor organised? Why did there appear to be no trace of any buildings? How did Torpel fot into the surrounding countryside in the old Soke of Peterborough? How did that evolve over thecenturies? There have been so many surprising discoveries. We had expected to find evidence of a typical motte and bailey site, such as Fotheringhay and Tout Hill in Peterborough, with a tower on the highest part of the mound surrounded by a moat and numerous buildings such as barns and stables on the more level land beyond. Roger de Torpel’s fortifed manor appears to have been a ringwork and bailey with dry ditches and wooden palisades surrounding a low, rectangular wooden building. We have documentary evidence of a stone manor house dating from 1280 and occupied for nearly 400 years. Geophysical surveys have revealed evidence of a rectangular building on an eastern extension of the mound as well as a large structure close to the pylon which is thought to have been a barn. The feld was called Barn Close on the 1799 Enclosure map, so probably some of its stonework was still standing. There are also some unresolved mysteries such as a circular structure with a diameter of 11.5 metres close to the barn. Nothing remains above ground and there is no documentary evidence, but it was revealed very clearly by the resistance research. Was it the largest dovecote in Western Europe or perhaps a mill or a threshing foor? Our book “Torpel – The Biography of the Landscape”, was launched on 30 September 2017.